The Frost Cutlery E.C. Simmons Trapper is a manual folding knife with two blades. The trapper knife style has been around for over one hundred years and was originally meant as a tool for skinning small game, now it would be perfect for any day-to-day tasks with a traditional look. 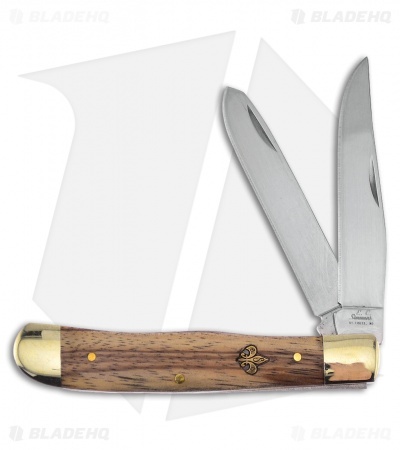 This knife has two stainless steel blades, one clip point and one spey, both with a mirror finish. The handle is brown zebra wood with nickel silver bolsters and inlay shield.